Romantic, 5 Star Luxury, 25' from the Ocean! Nothing but the lull of the waves! The beautiful pacific ocean is 25 ft away from your lanai! Listen to the waves and see the stunning views of Lanai and Molokai. During whale season, you can see whales all day long. The condo itself is designed as something I would expect from an upscale Maui resort. So it's very well appointed and very comfortable. Including a new high end Sterns & Foster Queen mattress! A vacation condo should feel like home and somewhere you look forward to returning to. Watch the new 360 degree video of what it's like sitting on the sea wall in front of the condo! You can even see one of the turtles that visit us daily. Since it's 360, you can click on the video and move the camera. Note: There's been some erosion on the beach directly south of the condo. So the nearest beach requires a couple block walk. There are also plenty of beaches within a 5 minute drive of the condo. The sea wall and lawn directly in front of the condo are unaffected. Key Amenities: Air Conditioner, new high-end mattress, 600 thread count linens, free reserved parking, wired/wireless super fast internet (100mb down/10mb up), flat screen TV, remodeled kitchen, remodeled shower, and lots of small amenities like a hair dryer in the bathroom and juicer in the kitchen. Check out the Google Map below with some great recommendations for eating and activities. See the video for the view off of the lanai. My name is Jim Tierney and I recently purchased this condo to live in 3 months of the year. I recently finished remodeling it and it came out beautifully. Since I'll be living in it, the remodel was necessary to make it someplace I'd want to stay. So this is not a normal rental unit where everything was done on the cheap! I love the Westin and their Heavenly Bed, so that was my target in creating the space (minus all the noise and timeshare sales pitches :-). I figure there's two things people want from a Maui vacation... 1) to see and hear the ocean from their lanai and 2) to get some sleep. 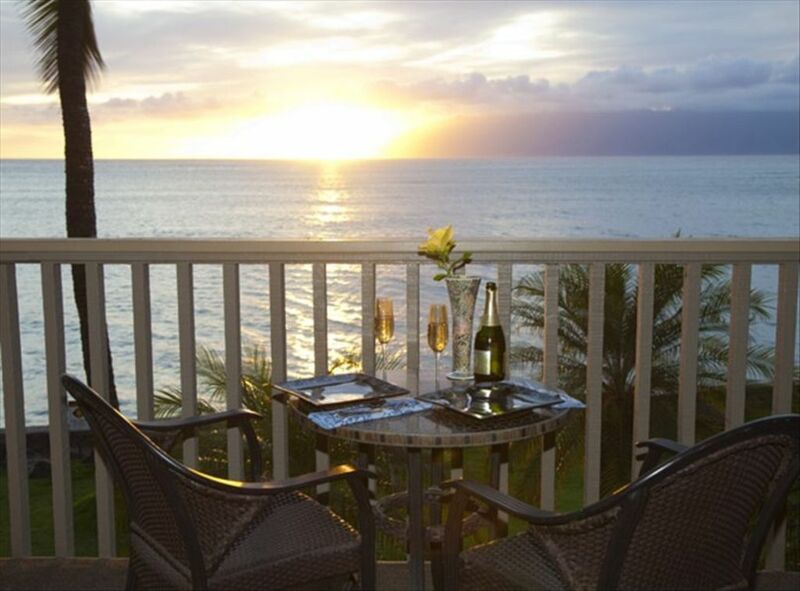 :-) As for the ocean, the condo is 25 feet away from the ocean so you can sit on the lanai and watch the waves crash into the sea wall or the sun set over the wide pacific and disappear behind Molokai. When it comes to sleeping I'm pretty particular about the mattress I sleep on, so it was important to find a good mattress that rivaled what I expect from the Westin. It's wrapped up in designer bedding and 600 thread count sheets. In February 2016 I got a new high end Sterns & Foster Queen Mattress. It's amazingly comfortable and I think you'll find it's wonderful to listen to the waves as you drift off to sleep. There's also a brand new air conditioner, which is not common in vacation rentals. Of course, there's the usual stuff, 32' flatscreen TV with DVD and cable, high speed internet with WiFi, speakers to plug an iPod into, hair dryer, small library of DVDs, and even a desk to write postcards on or check email (not that you'd be doing that on your vacation). There's also stuff like beach chairs, a boogie board, snorkel equipment, and beach towels. The couch becomes a queen sized, simmons sofa bed to accomodate kids or another adult. This IS a sofa bed. It's a nice one, but like all sofa beds it's not the paragon of comfort, especially for adults. There are two pools. However, this is a residential condo complex (meaning folks live here year round) so the pools aren't resort quality. There's no waterslides, bars, spa, lifeguards, or attendants handing you towels. They are nice, clean pools, but more modest than you'd find in a resort. Of course, the condo has pool/beach towels for your use and it's easy enough to mix up your own drinks in the blender. :-) There's also a couple day spas a short distance away. The unit is adjacent to a sandy beach which is great for swimming and snorkeling or just laying out. There's a grassy area directly in front with a gas BBQ, tables, and chaise lounges. You're one block from restaurants and shopping. It's an excellent central location to go north to Kapalua or south to Kaanapali, Lahaina town and the Lahaina Harbor. The condo is non-smoking and is on the second floor, up one flight of stairs. Hi, I'm Jim Tierney. I live most of the year in San Francisco and escape to Maui whenever I get tired of the foggy weather. I run a small software company and have the good fortune of being able to work anywhere there's an internet connection. Luckily that's the case with Maui, so whenever I get an urge for whale watching, diving, or laying in the sun it's no problem coming over. I love diving and the diving in Maui is spectacular, there are some really beautiful spots. I also have a passion for photography, particularly whales and outdoor scenes, so you'll see some of my work on the walls of the unit. I hope you'll check out my place. I put a lot of work into it making sure it was a livable space for when I'm there. So I think the standards I have for the condo is much higher than most rental units. I bought this because I'll be there about 3 months of the year and I wanted something on the ocean. A friend of mine lives in the same building so I was very familiar with the property and all it offered (ok, so mostly it offered the ocean about 20 feet way :-). It's amazing to watch the sun set during the summer, see the whales during the winter, and listen to the waves all year long. A wonderful view (did I mention you're 25 feet from the ocean :-), a high-end, very comfortable bed, a full kitchen, and air conditioning. 25 feet away from the ocean! There is a reserved spot in our parking lot, however it is not covered. Recently remodeled kitchen with granite countertops, beautiful wood cabinets, designer plates/tableware, and plenty of good cooking equipment. The dining area is the table on the lanai. Ocean front dining! Speakers with an audio connector for your mp3 player. A good selection of about 25 movies. These are available to rent from the condo managers. There are two pools for the complex. Not only did we have everything we needed, but, as described, the lanai is mere feet from the ocean. We spent all our relaxing and meal times on that lanai. Nothing obstructs one's view of the ocean unless it's the well placed palm tree adding to the scene. The other guests were quiet. We slept soundly on the very comfortable bed with the windows and slider wide open so we could enjoy the breeze and the sound of the waves. We felt safe walking the neighborhood, day or night. One does have to be alert to traffic walking on the side of the road at night. There's a powerful flashlight for safety. There's binoculars for whale watching (we didn't spot any but are on the tail end of whale season), small beaches within walking distance, and beach gear to borrow such as an umbrella, beach chairs, beach towels, a boogie board and a small picnic cooler. Snorkeling gear is available but incomplete - but rentals are cheap and just across the street. We never once spoke to our host or the property managers because the information provided after booking was timely and complete. With that organization I have little doubt we would have been successful getting any questions or concerns answered promptly. From the moment we left the airport we had complete directions to the condo, driving there after dark. The travel book Maui Revealed, for your use is the only book you'll need. Don't hesitate to book this property! We'd love to return. We never accessed the two pools because why, with more beaches than you can possibly visit in a week? We didn't use the laundry but it is literally right across the street. There was plenty of storage so you didn't have to live out of a suitcase. And my personal peeve of never having adequate lighting happily didn't come into play. There is plenty of lighting to every corner of the room. This place is fantastic! Highly recommend. Everything stated is true. The place is beautiful, in a ridiculously great location. You are steps from the beautiful blue Pacific Ocean. Jim’s place is fully (and I mean fully) stocked. You will want for nothing. I loved the stay so much that I booked a 2nd time (I actually extended my stay and rented Jim’s place a 2nd time- it was THAT good!) You are very near Kapalua Beach and Trail (less than 2 miles.) Only thing is that you are not directly on a beach, very nearby though. Other than rhat, I was completely satisfied. Place is big for a studio. Great bed, awesome shower, and plenty of room with a fully stocked kitchen. However- it is the Lanai that makes this place unforgettable. You are virtually on top of the ocean and the sunsets are insane.Lastly, Jim leaves such a detailed list of places to see and things to do- with directions- that your time is maximized with great recommendations (food, drink, shop, activity, etc.) I just checked out today and already miss the place. Thank you Jim!!! Great location on North Shores of Maui!! Close to beach’s and great snorkeling!! We saw tons of Whales right off the balcony! Some of the furnishings could use work but otherwise not a bad thing to say about the rental! Would definitely stay again!! It looked exactly as the pics posted! Beautiful!! Very clean. Condo is stocked with everything you need for the beach and kitchen. Beautiful view and ocean sounds! Great location! Not in the middle of the business but also not far from it. A little piece of paradise! This condo was well stocked with the amenities needed for a nice stay on Maui. The views were breathtaking and the sound of the waves will stay with me always. Jim made the stay easy without any hassles, very well organized. We will definitely be back! Mahalo! Not all activities are located on site but are within a 15 minute drive from the unit. Rates are subject to change until reservation is confirmed. Lower rates may be available for stays of 7 days or longer, last minute stays, or other situations. The $300 deposit is refundable if the reservation is canceled prior to 45 days of your stay. Within 45 days it is not refundable. Once the full amount has been paid (due 30 days prior to your stay), it is also non-refundable. If you do cancel within 30 days, we will make every effort to re-book the condo as we would prefer not to charge guests that don't end up staying. If so, you'll be issued a refund for the amount that we are able to re-book. Unfortunately, last minute bookings are somewhat rare. Most folks plan Maui vacations well in advance so most likely we will not be able to give you a refund.